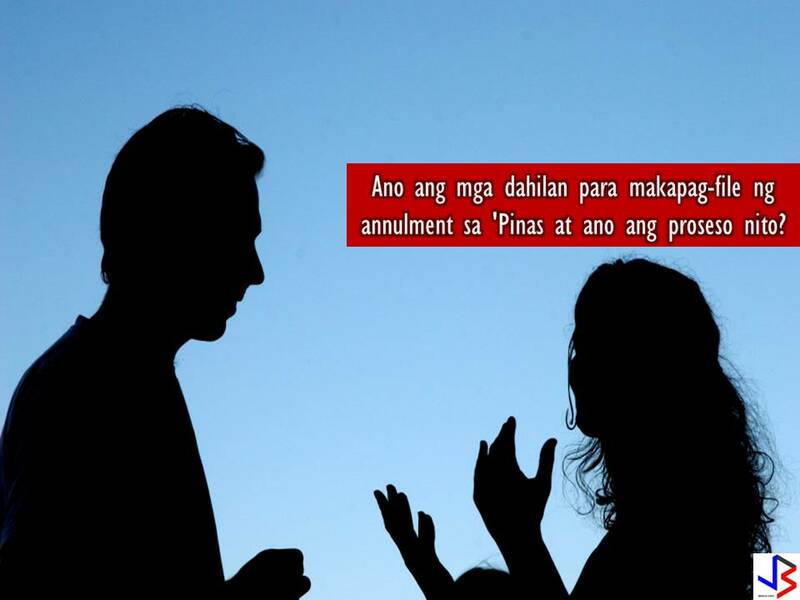 THOUGHTSKOTO Thoughtskoto : What Are The Reasons To File Annulment and What are the Process in the Philippines? 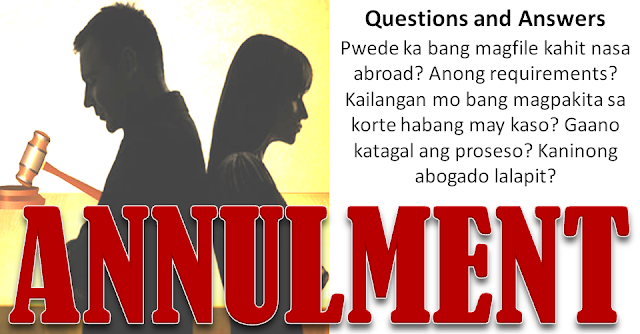 What Are The Reasons To File Annulment and What are the Process in the Philippines? Q: What is annulment or nullity of marriage? L&B Law Office: Annulment is when the marriage is valid from the very beginning but can be annulled on various grounds. This is the term commonly used by Filipino layman but it is not commonly used by Filipino lawyers because it is more difficult to prove and in most cases, the circumstance of the married person does not fall in this category. Art. 45, of the Family Code provides the grounds for Annulment of Marriage. Declaration of Nullity on the other hand, states that the marriage is void or did not even legally exist in the first place. A Filipino or Filipina can marry again once there is a final judgment from the court that declares the marriage as null and void from the very beginning. The case that will be filed is what we call “petition to declare the marriage as null and void” and commonly called as “petition for nullity of marriage”. Hence, for the purposes of remarriage, a void marriage must be declared and there must be a Judicial Declaration of Absolute Nullity of a prior subsisting marriage before contracting another. Otherwise, you commit bigamy. The marriage is null and void due to the absence of one or more of the essential or formal requisites of marriage as stated in Art. 2 and 3 of the Family Code. Most petitions for nullity of marriage are based on psychological incapacity of the other spouse. Q: What is psychological incapacity? L&B Law Office: This psychological incapacity is not necessarily insanity but it means that the other spouse has certain dysfunction, or psychological trait or make up which prevents the person to comply the obligations of marriage. It is so encompassing and maybe, general that gives lawyers and litigants a leeway on how to prove the case. But there are already various Supreme Cases that will guide the practicing lawyer and litigants of whether their case will fall in this category. Q: Can I file a petition for nullity of marriage even while I am abroad? L&B Law Office: Yes, you can file a petition for nullity of marriage even while you are abroad. What is required is for you to have the verification of your petition and your affidavit notarized before the nearest Philippine Embassy or Consulate in the country where you are residing or working. YOU WANT HELP FROM LAWYERS TO START A CASE? You can inquire or ask initial questions by sending email at mlepiten@gmail.com and fionahbojos@gmail.com. Please note that L&B Law Office is based in Cebu and in rare instances they can cater to other areas within Visayas. They don't handle cases in Metro Manila and Luzon. Q: What are the list of requirements? Q: How long does it take for the proceedings to be completed? L&B Law Office: Based on the cases we have handled in Cebu City, if it is an uncontested case, meaning the other party will not oppose your petition for nullity of marriage, it will take an average of a year or more for a decision to be rendered. This is because the caseload of the courts, the availability of the prosecutor, judge and court personnel as well as the availability of the petitioner and the psychologist have to be considered. The time frame may vary for other places like Manila or Davao. Q: How many times do I need to be personally present at the proceedings? L&B Law Office: You will need to personally appear at least three times. The first will be before the city or provincial prosecutor during the investigation for collusion between the parties. The second will be during the pre-trial stage. If you have executed a special power of attorney in favor of your lawyer authorizing him/her to appear in your behalf for the pre-trial, then you need not attend the pre-trial stage. This is usually allowed if the petitioner is working abroad. The third time is when you will be presented before the court to give your testimony about your marriage and your relations with your spouse. Q: Can I file the petition for nullity of marriage without the consent of the other spouse? L&B Law Office: Yes, you do not need to get the consent or the signature of the other party. As a rule, parties are not allowed to come to an agreement about the filing of the petition. That is why the Office of the Solicitor General, through the prosecutors, conduct an investigation for collusion, in order to determine whether or not the parties have colluded with each other in filing the petition or are involved in fabricating evidence. Q: How much is the amount of the whole Annulment process? L&B Law Office: In Cebu, if not contested, the estimate is around P120,000 to P150,000. QUESTIONS ABOVE AND OVERVIEW BELOW WAS TAKEN FROM THE LEPITEN AND BOJOS LAW OFFICE. Reposted with permission. This is an overview of the procedure in the filing of civil cases involving annulment of marriage or declaring its nullity due to psychological incapacity that is not contested by the other spouse. This is a general outline and there may be instances that these steps will not be followed. This is prepared by the Law Office to guide clients so that they may be able to follow their case. 1. The client goes to the lawyer and presents his/her case. Please see Law Office checklist if you have all the requirements. After conferring with the lawyer and submission of all of the requirements, the lawyer will prepare the complaint. Note: At this stage, it is advisable to secure the services of an expert witness (doctor, psychologist) who can testify on the psychological incapacity of the respondent. It is also advisable that the executive summary of the report of the expert witness form part of the complaint. 2. The compliant is filed before the Central Office of the Regional Trial Court. Raffling of cases is done every Monday of the week. Cases involving annulment and all other cases related to family matters will be raffled only to the designated Family Courts. This will take about a week. As of now, the Family Courts in Cebu City are RTC Branch 6 presided by Judge Ester Veloso, RTC Branch 20 presided by Judge Bienvinido Saniel, RTC Branch 22 under Judge Manuel Patalinghug and RTC Branch 24 under Judge Olegario Sarmiento. After the raffle, the complaint will be forwarded to the selected court. 3. The Court will issue summons one or two weeks after the case is raffled. The respondent has 15 days to file his/her answer. In some instances, the lawyer of the respondent may ask an extension of 15 days to file his/her answer or any pleading. 4. The Court will issue an order requiring the plaintiff to submit copies of the complaint to Office of the Solicitor General and the prosecutor assigned. 5. The judge will order the prosecutor assigned to the case to investigate whether collusion exists between the parties and if the evidence submitted is not fabricated or suppressed. The prosecutor is usually given 20 days from receipt of the order to investigate the parties. This is based on Section 3(e), Rule 9 of the 1997 Rules of Civil Procedure in relation to Article 48 of the Family Code. 6. The report of the investigation of the prosecutor should be submitted ten (10) days after the 20-day period. 7. The court will hold a preliminary hearing, which requires both parties to attend. A pre-trial order will be issued. Usually the preliminary hearing is called about two to four months after the filing of the complaint. 8. Hearing – this is the time when plaintiff will present his/her evidence (real, testimonial and documentary evidence) The number of witnesses will depend on the case, but usually, two to three witnesses will be enough, if the case is not contested (meaning, the respondent will not object). The witnesses will be the plaintiff herself/himself, the expert witness and one collaborating witness. Note: The same procedure applies for every witness presented. While the plaintiff is presented, marking of exhibits will be done. Presentation of two witnesses may be done in two to three months time from the pre-trial stage, depending on the availability of the court’s calendar. 9. An Order will be issued directing the Office of the Solicitor General to issue a Certification briefly stating its reasons for its agreement or its objection to the petition within 30 days from the receipt of the order. This is in accordance with the decided case of the Supreme Court, Rep. Vs. Molina GR No. 108763 Feb. 13, 1997. Likewise, the plaintiff will be directed to submit all exhibits and transcribed stenographic notes (TSN) to the Office of the Solicitor General within 7-15 days from receipt of the order. 10. The Court will then issue an order that the case is submitted for resolution. The decision may be released 30-90 days after the said order is issued. This kind of case may be finished from a year or more depending on various factors like the complexity of the case, availability of the court, witnesses and documentary evidence. SEE ALSO: CIVIL ANNULMENT, HOW MUCH IS THE COST?